During the early 20th century, Manitoba's economy boomed and its population grew dramatically. With sharp increases in memberships, many churches found it necessary to replace their buildings. In 1909, the members of Westminster Presbyterian (now United) Church concluded that their 1893–94 building was inadequate for a congregation of almost 1,000 members. A new site, closer to the homes of many of the parishioners, was selected and the church was built between 1910 and 1912. 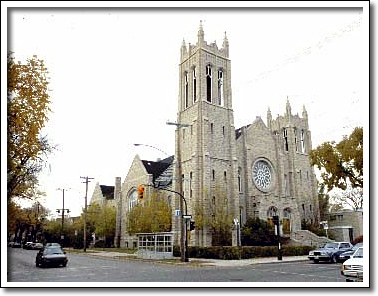 For its grandest buildings—Westminster, Augustine (1903–04) and Knox (1914–18)—the Presbyterian Church in Winnipeg called upon renowned architect J.H.G. Russell (1862–1946). For each church, Russell relied on a different interpretation of the Gothic Revival, a popular architectural style that drew its inspiration from medieval churches. Russell's design was based upon the English expression of Gothic and emphasized pinnacled towers, slender vertical supports and large openings, in this case featuring a beautiful rose window.